Looking to save time in Premiere Pro CC? These quick tips can speed up your workflow. 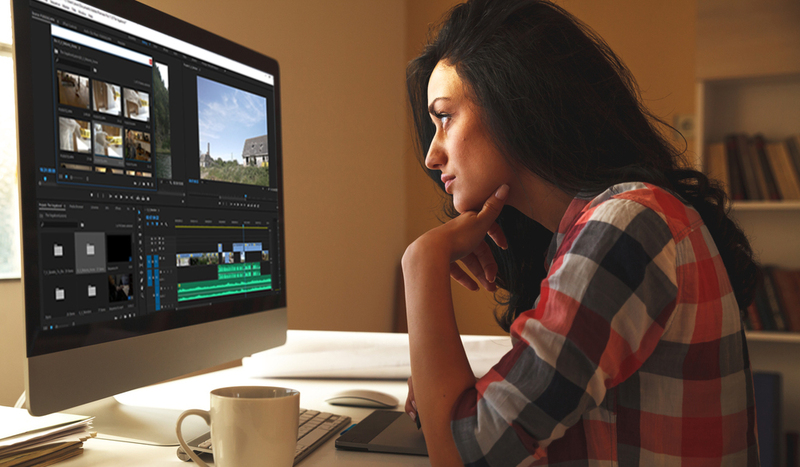 Recently, we covered five practical tips that can increase your efficiency in DaVinci Resolve. Let’s have a look at few more tips, but this time in Premiere Pro CC. These tips aren’t life hacks, nor are they hidden treasures known only to Premiere’s developers. However, these tips often get overlooked in guides, and they can shave time off your project and reduce the number of steps from point A to point B. When you’re working with a deadline, any time you can save is crucial. A lot of consumer-grade camera equipment can now record up to 4k, but the consumer demand for 4k footage isn’t that high yet. So, if you are editing 4k footage in a 1080p timeline, you may find yourself checking the Default scale to frame size in the general preferences tab to keep your imported footage at the same size as the timeline. However, this removes very important resolution data, and if you select this option, you might as well have just shot at 1080p. Instead, you want to hit set to frame size, which will decrease the scale size of the clip to 50%. This will allow you to increase and crop (if needed) the 4k footage. However, selecting this on every single shot is two mouse clicks too many. So, what we can do is open up the Preferences panel, go to the keyboard shortcuts, type in “set to frame size,” then pair it with an available key. I’ve chosen 1 on the number pad. Now you can decrease the scale of the clip to the correct timeline settings with the push of just one button. I place every project of mine into an organized system of bins. Each scene has its own bin, and within that bin, the footage and audio for that scene also get their own folder. This keeps my project panel neat, and I know where everything is at any given time. However, by default, when you open a bin, it pops out into a new window. Before I knew that there was a setting to change this, I spent a lot of my time moving the bin window away from the source monitor. Bin windows appearing automatically over the source monitor isn’t the best default placement, since you’re going to want to preview the contents of the bin on the source monitor. Luckily, you can change this so the bin window opens within the project tab. Simply go to Preferences, select General, scroll down to bins, and change the double-click option from “open in new window” to “open in place.” Now, whenever you open a bin, it will remain within the project manager. This will remove the additional step of moving a bin around your interface while you preview files. Although dragging footage into the timeline without the audio is a basic task, the web is full of questions about how to do this. If you’re working with drone footage or documentary footage — or anything that makes the sound redundant — it can become a pain to unlink the video footage and then delete it. There are several ways to simplify this. When your footage is in the source monitor, once you have marked your in and out points, drag the footage in by dragging this icon, instead of the clip itself. If you already have linked media on the timeline and going through it all is going to be too tedious, you can select all the clips that you need to unlink and hit CNTRL + L, then delete. When you’re working with both stills and video footage, unless you’re performing an insert/replace within an already edited sequence, it may be somewhat redundant to bring the still into the source monitor. After all, it’s not as if you need to scrub through it. However, dragging stills from the project manager can become problematic if you need to trim every one. Fortunately, you can automatically set every still duration. Go back to the general preferences, and you will see this section. By changing the seconds duration, you can control how long each still appears in the timeline by default. This is very handy if you have a series of stills that are going to play one after another. You can just drag them straight from the media manager into the timeline. Do you know any Premiere Pro timesavers? Let us know in the comments.